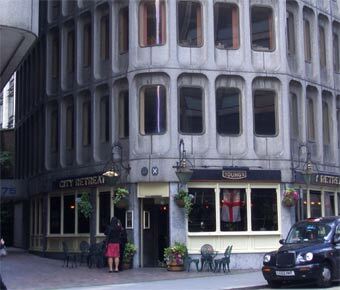 Don't be put of by the awful concrete building that houses the City Retreat, this is a very well run pub, with a friendly atmosphere and excellent selection of well kept Youngs ales. So many times in the City I've stood holding my tenner hoping to catch the bar staff's eye, only to find they serve the guy further along the bar when I've been waiting two minutes longer. But not in the City Retreat, the bar staff know what they are doing and do an excellent job. This honestly is reflected in the clientele, pop into the City Retreat anytime and you'll be pleasantly surprised, also take lunch, the foods not at all bad.